This coming season we’re proud to offer fifteen quality races across three disciplines, spanning the US. Building on the success and inspiration of our first three seasons, 2017 continues the explosion of international Skyrunning events that have captured the imagination of runners globally. This year includes our first 100 mile event at IMTUF100 in the beautiful Salmon River Mountains in Idaho. See how the Altra US Skyrunner® Series fits into the global world of Skyrunning at www.skyrunning.com. Other global races, including the Skyrunner® World Series and Skyrunner® National Series in other countries, will be announced in the coming weeks. The Rut’s three Skyrunning distances continue as the sole US stop on the SWS circuit. In addition, the North American Skyrunning Continental Championships will be announced at a later date. More details on Skyrunning, the 2017 Altra US Skyrunner® Series, and the scoring system are below. With multiple sets of races in the Skyrunning family, here’s a simple guide to them all. Skyrunner® World Series (“SWS”) – the foundation of the global Skyrunning movement, with 5 Sky, 5 Ultra and 5 VK events across the world with extremely high levels of competition. Runners score with their best 3 of 5 races from this Series plus 1 more from the new Skyrunning Continental Championships. These races will be announced at a later date by the International Skyrunning Federation. Skyrunning Continental Championships (“SCC”) – started in 2015 to allow runners to have an extra race locally to count for the SWS points. Skyrunner® National Series (“SNS”) – started in 2014 in multiple countries around the world to extend the concept of Skyrunning for more people to enjoy. Generally the same 5-5-5 format as the SWS with the best 3 of 5 races scoring for the SNS. Some SNS races are also in the SWS and SCC. 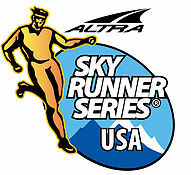 In the US, the local SNS is the Altra US Skyrunner® Series. Skyrunning World Championship (“SWC”) – occuring every four years, this is the Olympics of the Skyrunning movement. It occurs with multiple disciplines over a single long weekend. The last SWC was in Chamonix in 2014, with the next event set for 2018 with the venue TBC. Five Sky, five Ultra and five Vertical K® races are distributed across the country, offering expanded opportunities to run in some of the most beautiful locations in the US. Hundreds of miles of racing including well over 100,000 feet of vertical gain with inclines that will truly push the best mountain runners to their limits and offer unique experiences for every competitor. Distance + Vertical = Skyrunning. Legendary, iconic and prestigious events make up the calendar, with many of the Vertical K® races doubling up with Sky and Ultra events. The majority of the races have been created or adjusted specifically for the Altra US Skyrunner® Series, broadening the scope of competitive and spectacular Skyrunning races globally. The three best results in each Series are scored in the overall ranking for each runner. Ranking points in the final races of all three Series are increased by 20% then rounded. In the result of a tie for a podium position, head-to-head results are considered with the Series final as the most important result. Ranking points breakdown: 100-88-78-72-68-66-64-62-60-58-56-54-52-50 down to 1 point. Scoring goes down to 40th position for men and women. Total prizes: Every race has prize money.